In my last post, Racoon Rumble, I talked about the universe teaching lessons the hard way when you refuse to listen. I wondered if I was being sent a message that I needed to heed or else I would suffer the “consequences”. Well it didn’t take long for the “consequences” to happen. I am not sure I would actually call it a lesson. It was more of a warning, a heads up that something was about to happen that would cause family upset. I am a strong believer that the universe is always communicating to us through signs, symbols, serendipitous information, personal insights, and sometimes, knock you over the head messages. You only have to raise your head up, open your eyes and make the connections to learn from them. Last year I regularly saw the numbers 911. Most of the time I was wondering what time it was and 9:11 would be the time , but I also saw it other places. My total on a purchase would be $9.11 or the change would be $9.11. Once I was driving down a road and noticed a nice looking house, as I was admiring it, I realized that it’s address was 911. This number stood out in some obvious way weekly, if not daily, for about 6 months. I had to figure out what it meant. Also, the racoons were not my first animal omen. Around the time the 911 symbol was starting to peter out I received the most unusual visitor to my house. 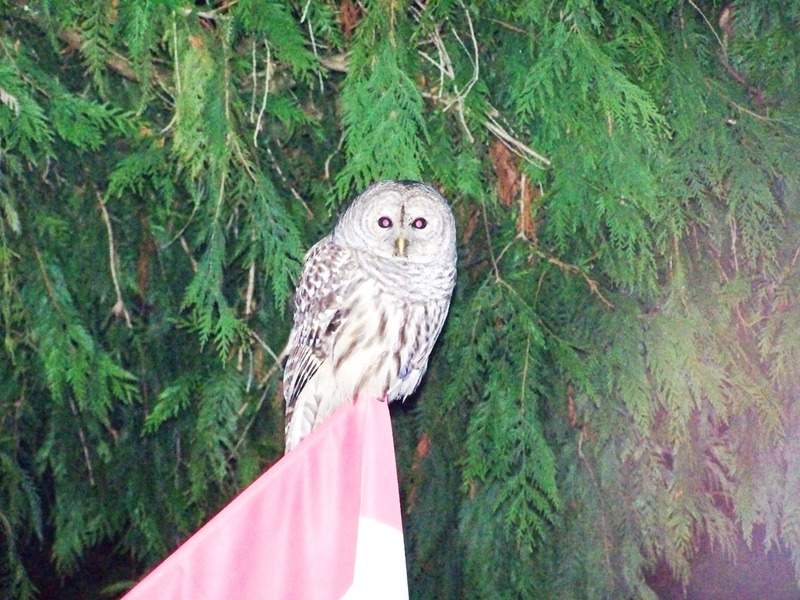 One evening, just a dusk, an owl perched himself on my flagpole and stayed there for almost an hour. He wasn’t bothered that I was taking his picture and other than looking around, he never moved. An obvious place to get the meaning for a symbolic message is in a symbol dictionary. I own several copies that I often use, and I also like to use Google search to help me explain the symbol’s meaning as well. One great site to try is www.symbolic-meanings.com the sites host, Avia Venefica, has a talent for explaining the meanings of a wide variety of symbols. But the most reliable reference for interpreting symbols and other messages from the universe is you intuition. I may source out several likely meanings from various resources but in the end it is my inner knowing that I use to decide how a message relates to me. As for my take on what seeing 911 meant to me, I felt it was a message to let me know that one phase of my life was finished and a new phase was about to begin. In numerology the number nine means completion and the number eleven can represent a doorway that one only needs to step through. In the case of the owl, there were several interpretations of what seeing an owl could mean. In some cultures, owls are bad omens, in others, good omens. My personal reference of owls is that of wisdom and knowledge, “the wise old owl”. I related it to where I was personally at the time given my understanding of the 911 symbol and my intuition felt that hootie came as a message for me to seek more knowledge in order to move into my new phase of life. Which I did. So what was the harsh lesson that was recently foisted on me? Thou shall not water plants on top of your husbands very expensive home theatre stereo amplifier. Well the plant was technically on top of the cabinet that housed said equipment but I over watered and it overflowed and the amplifier fried. My loving husband of 28 years was pissed. A time out was needed for injured parties to cool off. Even though I didn’t do this intentionally and my husband fully realized it was a grievous error on my part, I still felt like pond scum. I’ve done many stupid things in my life but this one gets a gold star! There was only one thing I could do to right this wrong, so the next morning I got into my car and drove to the electronic store and with my secret savings nest egg, I purchased the new, and improved model to replace the soggy old one. My husband loves me again. As best as I can figure, what the universe was needing me to learn was forgiveness. Not about my husband forgiving me, which by the way he has, the lesson is for me to learn to forgive myself. I have never had a problem forgiving others. If I have been wronged in some way or if someone has made a mistake that effected me, I have never had a problem forgiving and forgetting. I understand that grudges and hate is negative energy that only eats at me. I am not willing to let another person have that kind of power over me, besides most of the time that other person has moved on from the issue and doesn’t even know that I haven’t. It is just easier to let it go so there is more room for positive stuff. Forgiving myself on the other hand is completely different. It is so easy to mentally beat myself up over mistakes I have made and not cut myself any slack to the fact that I am a fallible human like everybody else. Yet forgiving myself is a strength I need that will enable me to move forward in my life. Knowing that it is ok to fail, to make mistakes, and being gentle with myself when I do is how I will acquire the confidence to get over the hurtles of life that get in the way of my dreams. I understand this concept intellectually but putting it into practice means I have to commit to the knowledge spiritually, that I, like everybody else on this planet is not perfect and mistakes are how I am going to learn as I move down my life path, which according to the universe, is unfolding perfectly for me. I got your message. There is no longer a need to continue this harsh, and expensive lesson. No further action is required on your part. Consider this part of the sacred contract between us completed and please file it away for future reference. Now go bug someone else.